No images of Live Solar Installations. Live Solar supplied a 5kw system using 20 x 250W Hareon Panels and a 5Kw Sun Grow Inverter. I am particularly impressed with the Inverter which has WIFI monitoring and logging , including an IPhone app. There was no rush to install ( read provide early payment ) as I was told clearly that the install would not occur until all the paper work had completed with the distributor / retailer. The only niggle I had, was that I was supplied with poly panels when I had sought and been quoted on mono. 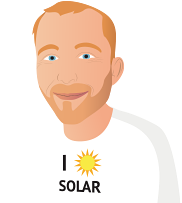 Live Solar provided with me with a discount to compensate for the slight difference in temperature coefficient performance. Overall I am very happy with the system, the independent Electrical Inspector praised the Live Solar installation teams work and stated that they have a solid reputation as far as installs go. While I used your quotation service and did have good communication with all of the companies that your service provided, I did also perform my own additional research and obtained 6 separate quotes in total. From all these quotes (including the ones from your site solarquotes.com.au) I examined each thoroughly, noting both cost and the quality of components used(incorporating specifications and real-world feedback), warranty, installation workmanship (as I was able to see first hand some of the installations) and the helpfulness of the salesperson from each company. I came to my decision based upon this comparison, ultimately not choosing the cheapest, or the most technically superior option - but the best quality vs cost that my budget, my wife and common sense would allow. Installation occurred yesterday (late Jan 2014), just over one month from the date of acceptance of the quotation (taking into account the Christmas/New Year break) - I found the installers to be friendly, knowledgable and professional. They arrived in a van bearing the company logo, which I found comforting knowing they only perform installation work for this particular company. Their work was of a high standard, neat (they cleaned up well after themselves) and I also valued their honesty as two tiles were broken/cracked (not an issue as I had spares) and they made sure to inform me of the breakage and replaced/repaired the damaged tiles without any fuss. I am looking forward to the inspector coming out to sign off and hopefully the power company doesn't drag it's feet too long to reconfigure my smart meter and I can take advantage of the sunny weather we are currently experiencing. Ask lots of questions, i.e., Every company I dealt with told me about their German panels. (They are all made in China). Two: company's offered me German inverters. heck on the internet found they were obsolete models. Lots of different warranties. One was for twenty five years on the workmanship, material, inverter. What use is this if the company goes broke in five years. Having researched on the web and finding about 85% of people were not happy with either their system of supplier/installer we were almost to the stage of not going ahead, but after finding this company we are so pleased that we did. It was only installed this week and the meter has yet to be installed but to date we are very happy.